Residents of Denver’s Stapleton neighborhood want a two-way, parking-protected bike lane on 26th Avenue, a street that straddles Aurora and Denver. The redesign would provide a safer place for people to bike while calming traffic — benefits that would help the Hancock administration achieve its stated goals of eliminating traffic deaths and increasing bike trips. 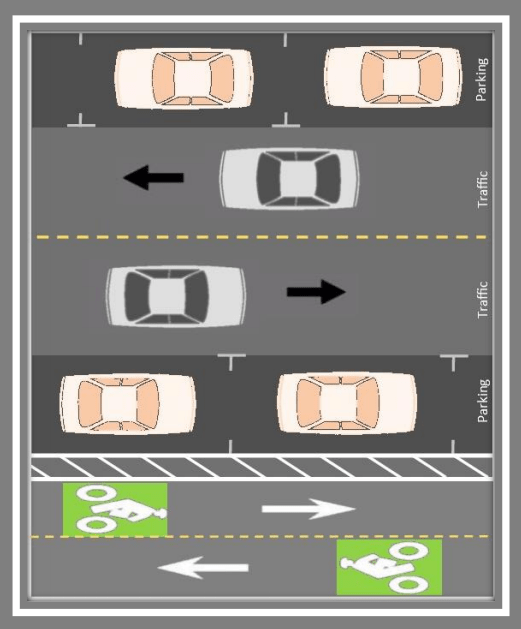 Instead Stapleton residents will get a wider street with standard, unprotected striped bike lanes on 26th. Why? It seems the administration’s right hand doesn’t know what the left is doing. Despite strong community support, Citizens Advisory Board (CAB) Co-chair David Netz acknowledged it will not proceed [with the cycle track]. Tom Gleason of Forest City and Bar Chadwick, city of Denver, both said their organizations do not support the cycle track idea. Forest City will proceed to widen 26th Ave. in conjunction with its development of a park and 322 dwelling units in Aurora according to the original plan that includes bike lanes. Chadwick is a project manager with the city’s finance department, not a planner or engineer from Public Works or Community Planning Development, the two departments that should be shaping Denver’s streets. For the record, Front Porch reports that a protected lane on 26th would not cost any more than unprotected bike lanes. Forest City is Stapleton’s most prolific developer, and wouldn’t you know it, they hold some sway. According to Front Porch, before the cycle track was nixed, its reps told Aurora officials, “We do not feel 26th Ave. is an appropriate location for such a facility.” Forest City didn’t want tenants of its future development to have to cross the bike lane to reach on-street parking spaces. The horror of looking both ways for bikes won out over a safer street. The protected bike lane proposal had substantial public support. It was floated by Northeast Transportation Connections, an organization that aims to improve transportation options. The group surveyed residents, who preferred the protected lanes to conventional bike lanes two-to-one. The Stapleton Citizen Advisory Board got behind it. To recap: Thanks to a finance department employee and a developer, Denver won’t advance its stated agenda to make streets safe and bikeable, despite ample neighborhood demand. The Hancock administration has to figure out how to elevate good ideas instead of squandering momentum for change. Stapleton is the same neighborhood billed as a Mecca for sustainable, modern development. But the premature end of the 26th Avenue protected is a wasted opportunity to create a safer, multimodal street. Super sad to hear that south Stapleton won’t be getting a cycle track. This is a popular route for bike commuters, with the hopes of promoting safe routes to the many schools along the way, and would give people a safer alternative to Montview. I’d like to echo how disheartening this is for Stapleton… So much potential lost. Forest City is a horrible developer -they always try to suburbanize urban environments. Article conclusion is overly dramatic. Lots more to infrastructure improvements then simply a “finance department employee and a developer” but that would take away from your point. Luckily there is still the scary sidewalk to use. Side paths are bike paths. The default protected lane. David Sachs . . . Your articles are always so skewed to one direction that I have a hard time taking them seriously. You do a disservice to your cause by being so bent in one direction and not objectively discussing the issues.